Dedicated to style, these Fertini designer lace-up boots are a desirable, high fashion option ideally suited to men that are looking for a premium finish and quality craftsmanship. The finish to the hair-on leather uppers of these boots is wonderful and the shear detail applied to every pair is absolutely astounding. 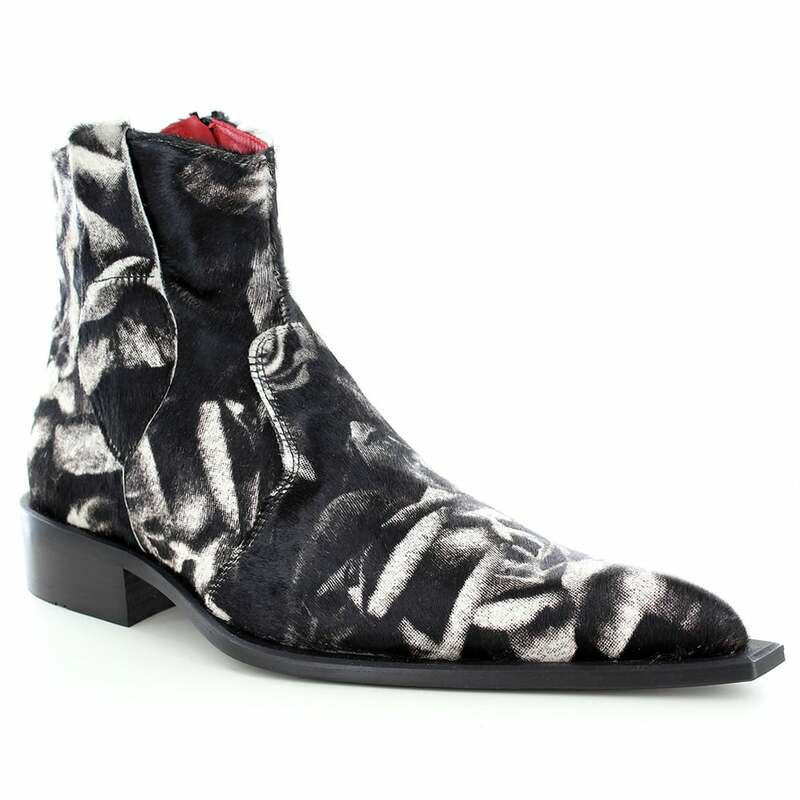 Fertini's 8515 leather boots have a stunning hair-on finish printed with contrasting white flowers on a black background background. Inside, the high fashion shoes are lined with a deep red leather, while the insole is padded to provide a premium level of comfort and finish. The stitching on the boots is high quality and perfectly compliments the appearance of the hair-on leather, blending in for minimal distraction from the already visually powerful print. Finished perfect with a decorative pull loop. The sole unit of the designer leather boot features a brushed finish, block heel standing 4.5cm (1.75 inch) tall. These premium hair-on leather shoes from Fertini epitomise the levels of quality and craftsmanship that all men look for in their shoes. Perfect for looking the part, the 8515 mens leather pony skin boots will compliment any formal or high fashion outfit making them suited for any big and important event or a night out in the city. Wearing these designer Fertini boots, you are guaranteed to stand out from the crowd and grab the attention of those around you. Buy your pair today and get them on your feet - you won't regret it!